The climate should be equable. It should have more than ample water. It should be virgin soil, never built upon. It should be land that could be tilled. And it should be given from the heart. 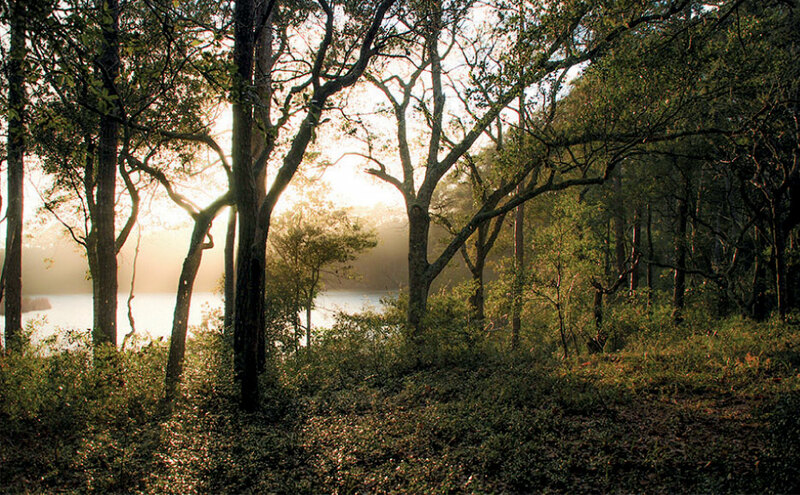 Sunrise over Long Lake, Meher Center. Baba Himself directed many details of the Center’s development; every phase of the work was done with the thought of pleasing Him. And He remained actively interested and involved with all Center activities throughout the years following His three visits in the 1950s. On Meher Baba’s first visit He expressed His pleasure with all that was done to establish the Center saying “… I am so happy to be here, and most of all I am deeply touched with the love and devotion shown by both Elizabeth and Norina throughout the past years in preparing such a unique spot for my work and comfort… of all the homes I have visited, this is the home that I love the best, because it was given to me and built for me with such love.” After a pause he added, “I never leave. Remember, I do not leave, because this is my home.” Accompanied by eleven companions from India, this first visit was for a month during April and May, 1952. It was a quiet, intimate, and special time with Baba when many westerners had the opportunity to meet Him for the first time. 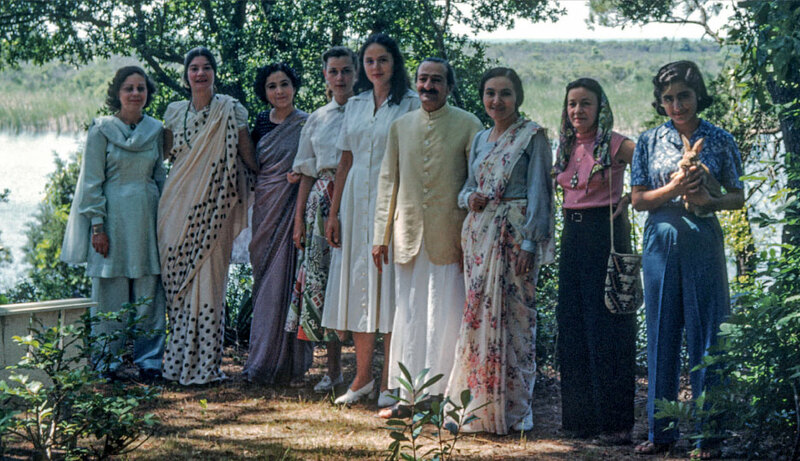 Meher Baba with Eastern and Western women devotees, Meher Center, 1952. Meher Baba at the Barn, Meher Center, 1956. 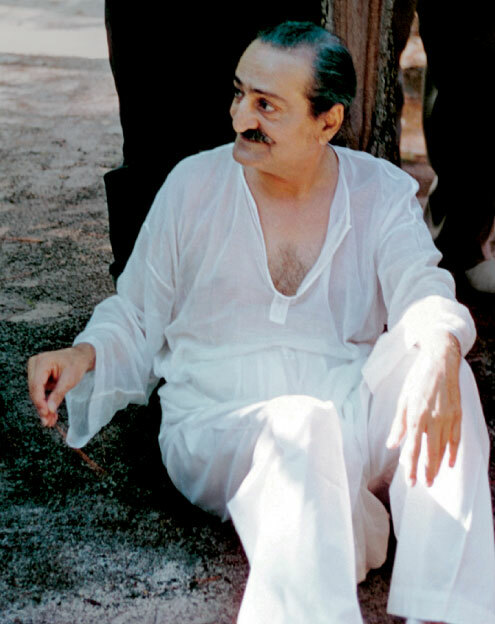 Meher Baba’s second visit to the Meher Center was in 1956, for six days at the end of July. During that stay Baba was radiant and full of vitality, walking throughout the Center, and engaging all those He met. Hundreds of people came to be with Him and the Center’s official dedication ceremony was held during an “open day”, on July 27. 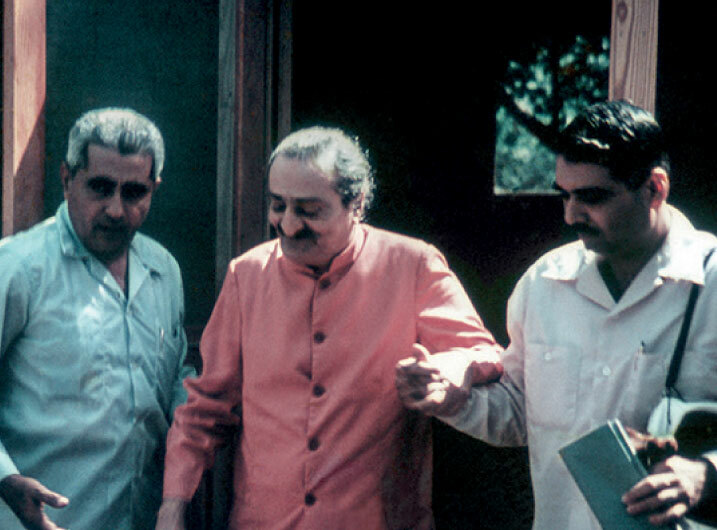 Meher Baba with two of His men mandali (close disciples), Meher Center, 1958. Early devotees came to Meher Spiritual Center to meet Meher Baba, many for the first time, and to have His “darshan” (auspicious sight) when He was here in the 1950s. Since that time the Center has continued to draw many thousands of pilgrims over the years. Meher Spiritual Center remains, as Meher Baba said it would, a place where He stays and is at home, where all can come to meet Him; a “place of pilgrimage for all time” imbued with His presence and inspired by His remembrance.